Use a media converter to convert a traditional wired Fast Ethernet connection to a fiber optic connection. Ethernet is a data-framing format that specifies how data is to be transferred over a network, regardless of the underlying physical format. This allows Ethernet to be used with copper wires, fiber optics, wireless and other methods of data transmission. An Ethernet media converter accepts the incoming signal from one medium and reformats it for the second medium, such as electrical pulses over copper to pulses of light over an optical cable. Insert the modular RJ-45 connector from the Fast Ethernet cable into the RJ-45 port on the media converter. Connect the media converter to a power source. Turn the converter on, if it has a separate power switch. 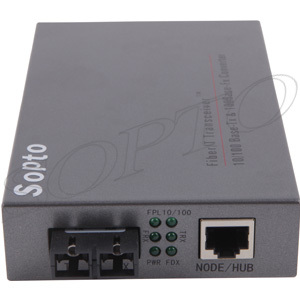 Sopto supply high quality fiber media converters like Gigabit Media Converter, PSE Media Converter and Remote Media Converter and so on. For the newest quotes, please contact a Sopto representative by calling 86-755-36946668, or by sending an email to info@sopto.com. For more info, please browse our website.